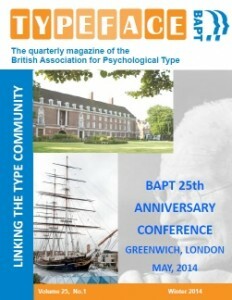 ‘TypeFace‘ is the quarterly magazine of BAPT and includes articles and news covering a wide variety of topics related to MBTI® and other personality type instruments. This is a key benefit of BAPT membership. Regular features include theoretical articles written by UK and international experts; articles relating to the application of type in different areas (Careers & Occupations, Diversity & Multicultural Issues, Education Learning & Development, Management & Organisational Development, Psychotherapy & Counselling, and Religion & Spirituality).